Bengal tigers usually breed in the spring. A neighboring male will mate with a female in her home range. Of the 20-80 days he remains with her, she is fertile for only 3-7 days. After mating, the male returns to his home range and plays no part in rearing the cubs. 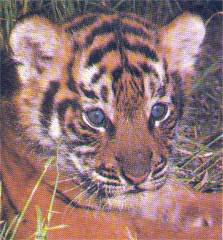 Approximately 15 weeks later, the tigress gives birth to two to four cubs. She suckles them for 8 weeks, after which she brings them prey to eat as well. At 11 months, the cubs can hunt on their own. The Bengal tiger cubs stay with their mother for 2-3 years, at which time she is ready to mate again.